If you think food needs serious manipulation in order for it to be delicious, take a taste of anything at Salud Raw Foods and prepare to have your mind changed, and blown. 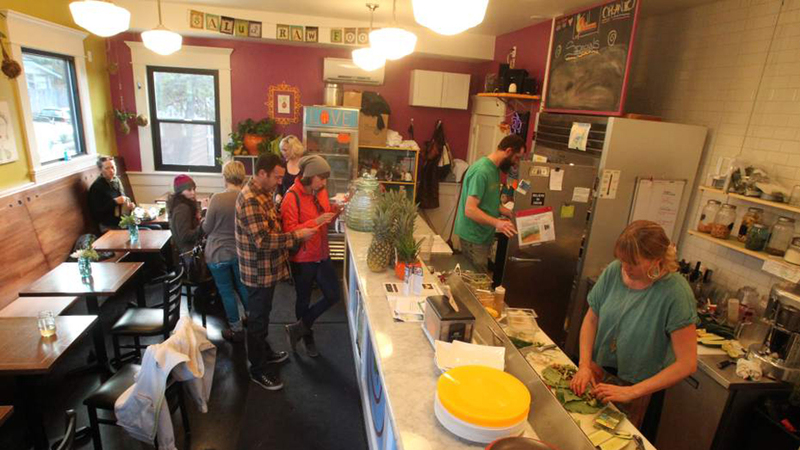 Located on Franklin Avenue in downtown Bend, Salud Raw Foods is a raw foods vegan joint, which means everything is plant-based and it’s all raw. On the menu is a huge selection of sweet and savory smoothies, juices, tonics, and shots, all using fresh, organic fruits, veggies, roots, herbs, and spices. You can also make a meal out of the sweet potato nachos, hummus platter, breakfast burrito, tacos, tempe bowls, and a whole lot of tasty collard wraps and crunch, hearty salads. This tiny eatery is also churning out desserts that will satisfy a serious sweet tooth; carrot cake, strawberry shortcake cupcakes and vanilla chocolate flowers are amazing and almost too pretty to eat. Almost. Salud Raw Food is open Monday – Saturday from 10:00 a.m. – 4:00 p.m. and eating your veggies has never been so much fun.